Where do you live, and what are your interests? I’ve been living in Kobe, Japan for three years now. I was Master student at Kobe Institute of Computing for two years, then I did internship for six months at iCRAFT Corp, a Japanese IT company in Kobe. And now I work as a Network Engineer at the same company. Outside of work, I’m usually playing soccer, watching movies, traveling around Japan with some friends and family, and going for some volunteering activities nearby. 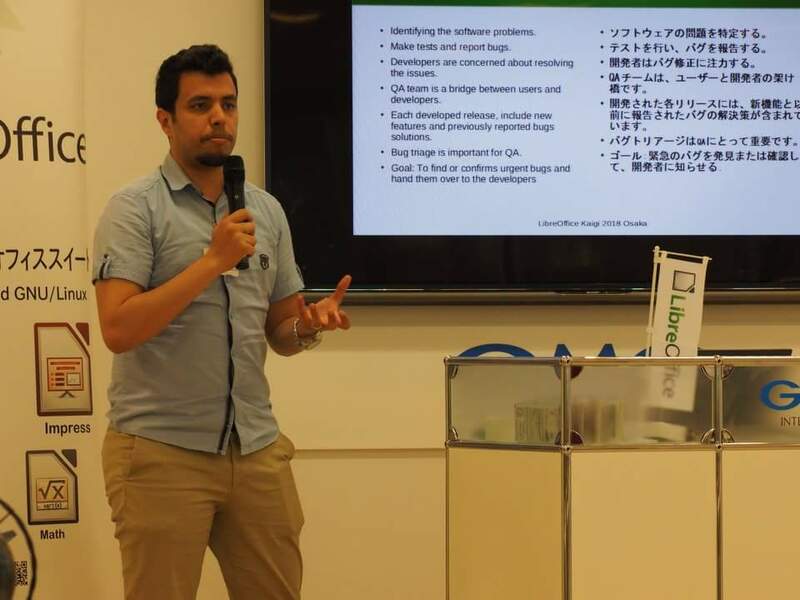 My LibreOffice activities are around QA/bug triaging, the translation projects (to Arabic), and LibreOffice promotion by giving presentations at IT-related events in Japan. A few years ago I was involved in social volunteering activities like charity events, earthquake clean-ups and so on. In the last year during my internship at iCRAFT Corp, which was supporting the project, I was assigned to contribute to LibreOffice development in any area I wanted or found interesting. I liked the idea, and considered it as a new way of volunteering in my life – let’s call it “Digital Volunteering”. It was my first experience with open source development, so it took me a while to get adapted to the activities. But seeing the progress of my contributions in numbers, like the LibreOffice Arabic translation improvements, motivated me a lot. I think that all what LibreOffice needs is to keep improving support for other formats than Open Document, like docx and xls from Microsoft Office. I’m looking forward to meeting other LibreOffice members and celebrating all new improvements together! Where do you live, and what are your interests outside of LibreOffice? I live in beautiful Kodiak, Alaska, USA. Apart from LibreOffice, I mostly deal with laundry stuff in one way or another, and play guitar – not so good, even though some say different. Oh and I try to catch fish with fair success. User interface bug fixes and enhancements. Calc cell protection wasn’t working and I needed it for some macros I made using Basic. I thought I might be able to fix it. It got fixed before I could even see day light through the code jungle I had entered. After a while of hacking my way through the jungle I managed to change a old school pointer to a std::unique_ptr for my first commit. Truly exciting to be contributing with others from all over this planet. Finally, what tools do you use for your work (eg text editor)? I mainly use Qt Creator. Qt is what I’ve used for most of the programming I’ve done. Thanks to Mohamed and Jim for their time, and contributions to LibreOffice! If you’re reading this and want to help out, and make new contacts in our friendly worldwide community, see this page to get started.